Each November brings the opportunity for American citizens to make their voices heard on Election Day. No matter if it is a local race featuring your friends and neighbors or a federal election for President of the United States, each person (with little exception) has the right to cast their vote and make their voice heard. But politics can be a confusing game, particularly for people with intellectual or developmental disabilities. Attack ads and divisive rhetoric and campaigning techniques make it difficult for anyone to separate rhetoric from policy, and determine who might represent their interests best once elected. Voting is the first step in taking part in our local, regional, and national government, and one that has only recently been put on a level playing field for people with a disability. There was a time not long ago when Americans with disabilities were left out of the political process. Sweeping civil rights movements in the 1960s helped to shape our country’s always evolving direction for treating all citizens as equal. However, it was The Americans With Disabilities Act of 1990 (and updates in 2010) that introduced the bedrock of many regulations and protections that were left uncodified. Still, it was not until the Help America Vote Act of 2002 was passed that protection of voting rights was truly examined, along with putting the physical equipment used to cast a vote as subject to inspection. This distinction is so important to many that would otherwise have tremendous difficulty casting a ballot with pen and paper. In Springbrook’s area of New York State, the ImageCast is the standard ballot counting machine. The NY Board of Elections has put together a full description of the different adaptive equipment that can be used with the ImageCast. We visited the polling locations for the Town and City of Oneonta and the Town of Milford on the day of NY’s Federal Primary Election in September 2018. Each location had on-site at least one adaptive device, and some had all described devices. Those that did not informed us that they could call the main office in Cooperstown to make additional devices available. Everyone has the right to have assistance from another person when voting, along with many other rights that New York State has outlined. These rights are a huge step forward for EVERY citizen in New York! “All of our inspectors have been trained to respect any voter that requires assistance, and to be treated with genuine politeness and helpfulness. If the voter requires assistance in voting they may request a bi-partisan team of inspectors to aid them, but not influence their vote. If the voter has been accompanied by an outside agent then they may assist the voter.” said Carol Franklin, one of the two Commissioners of Elections from Chenango County. This commitment to citizens with a disability is especially important to the dozens of individuals that Springbrook supports in the Norwich area. Likewise, all poll station workers that we visited in Otsego County were helpful, friendly, and knowledgeable about the accommodations available to all citizens. While the experience we had with local polling locations was overwhelmingly positive, that is not the case everywhere across the country. In a 2016 study of 178 polling places, 60% (107) had some sort of physical impedance, from parking to problems in the voting area. Still, in another 2012 study, more than 30% of individuals with a disability reported difficulty in voting compared to just 8.4% of voters without a disability. This type of difficulty can be frustrating, as it de-incentivizes individuals with a disability from casting their vote. Another report shows sixteen million people with disabilities reported voting in the November 2016 elections. However, that was six percentage points lower than that of people without disabilities; this gap could have accounted for 2.2 million votes in 2016! With the 2018 general election just behind us, you can see which candidates were successful in their election campaigns here. If you haven’t already, learn their names, contact their offices, let your voice be heard the other 364 days of the year—not just on election day(see this piece on how congressional lawmakers handle correspondence)! Talk to these elected officials about what is important to you. Do they have accessibility/universal design, Medicaid, and other issues that affect individuals with a disability as a cornerstone to their policies? Stay informed. 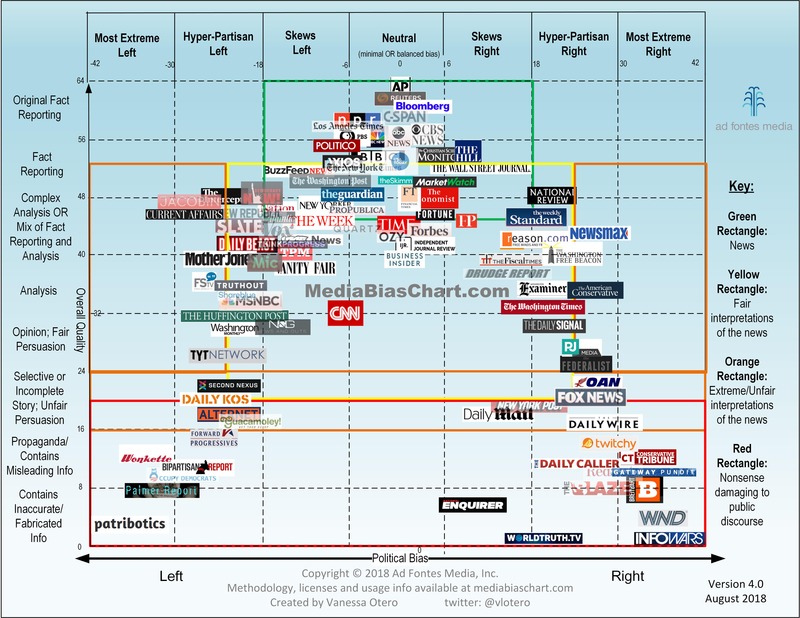 This chart is a popular guide to the quality and bias in news sources. News sources in the center at the top of the chart are factual (AP, Reuters). The further down and left or right a source appears on the chart, the worse their quality of reporting is considered. Knowing your representative is only half of the equation; you need to know what issues they are passionate about if you hope to offer your opinion to them. And remember, a representative’s job is to work on behalf of every person is their village, city, district, state, or country, regardless of their political affiliations or personal opinions. The 2019 election is 363 days away at the time of publishing. Your chance to register to vote is today. Help a friend or loved one with a disability register today too. Talk to each other about local, state, and federal elections, the men and women who are campaigning, and what issues are most important to you. As we saw from the study in 2016 above, if more individuals with a disability come out to vote in 2019 (and for the next federal election in 2020), demographics could look significantly different than in previous years. The most important thing for everyone to remember is that YOUR VOTE MATTERS. Contact your Board of Elections if you have questions. Every voice is important. *Disclaimer: The goal of this piece is a non-partisan look at voting rights, specifically for Americans who have disabilities. The author of this post recognizes his own liberal bias. Springbrook does not support any one individual candidate. Instead, we hope that anyone who reads this article will consider what is most important to their lives and which candidates advance those causes before making a call, sending a letter, or casting a vote.